The ROA-TwinBlock appliance it is designed to have the advancement mechanism on the occlusal surface. Through this mechanism, the jaw is able to advance even further than other appliances by approximately 6mm. The ROA-TB design makes it extremely comfortable for the cheeks and the tongue, improving treatment results. Another exciting feature of this appliance is the availability of various colors for its fabrication. Rather than having a clear appliance, you can choose from a variety of colors to personalize your ROA-TwinBlock appliance. This appliance is a device that has the flexibility that allows more freedom for lateral movements than the standard Herbst type devices currently available. We offer the ROA-Herbst to further improve treatment of you patients suffering from sleep apnea so that they can get a better night’s sleep. In recent years, the Dorsal Device has evolved into one of the top choices for snoring and obstructive sleep apnea. 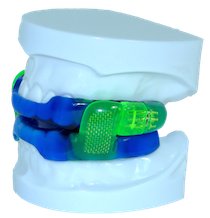 The Dorsal Appliance is an intra-oral device that resembles a custom fitted mouth guard. 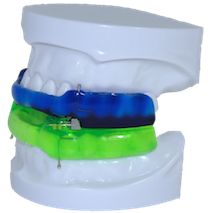 With a two-piece construction, patients experience comfort and lateral jaw movement during treatment with the Dorsal Appliance. Additionally, the Dorsal fins on the mandibular appliance interface with inclines built into the buccal of the upper appliance in order to dictate a specific mandibular position. 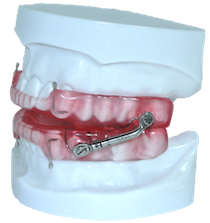 Fabricated with adjustable screws, this oral appliance allows for further mandibular advancement and treatment adjustment when needed. Contact us to further discuss the ROA Series of appliances and to know if any of these devices would be a good oral appliance alternative for your patient’s treatment.